Winter is harsh on the skin. Dry climate, cold temperatures, and indoor heat all work together and conspire to strip our skin of moisture, color, and softness. And if you spend a significant amount of time enjoying the wintry weather, be it through work or play, your skin is sure to be protesting. 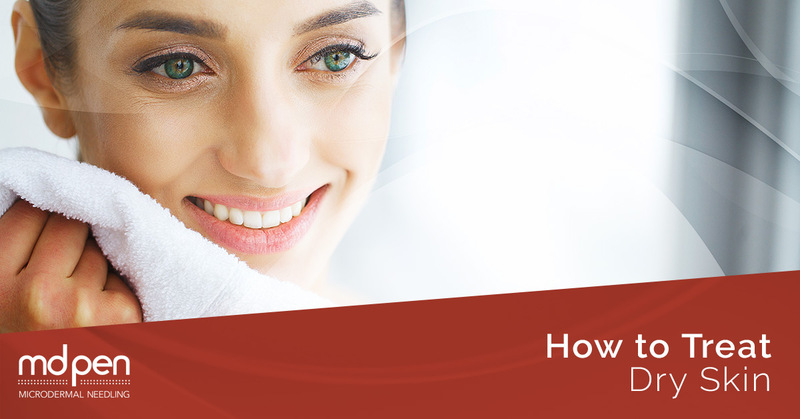 MDPen, a supporter of microneedling physicians through our proprietary skin care line geared to microneedling before and after care and our microneedle pens, offers up tips to help you relieve dry skin and prevent it in the first place. Wear protective covering when outdoors. Preventing the wind and cold from accessing your skin in the first place will help prevent dry skin. Wear gloves, hat, and a coat that zips up high. Do the dishes. Yep, we said it. Believe it or not, your hands being wet helps your skin cells absorb moisture content, especially when they are dry. Do the dishes. Give your dog a bath. Go for a swim. Do activities that require you getting wet. Shorten showers. While water is a good thing, too much of a good thing can be detrimental to your skin. Showers and baths strip your skin of essential oils mainly due to the temperature. Lower the temperature and moisturize immediately afterwards. This is for two reasons: 1) to lock in the water content currently on your skin from the water and 2) because hot water opens up your skin’s pores, creating an optimal window of absorption. Choose ointment, serums, and creams over lotions. We all know moisturizing regularly is important to prevent dry skin. We also know not all moisturizers are created equal. Choose moisturizers with ingredients that are nourishing (water-based) and not detrimental (alcohol-based). MDPen’s incredible Pure Hyaluronic Acid Serum replenishes the skin’s moisture reservoir, while restoring firmness and elasticity to combat the signs of aging. Containing deionized water, hyaluronic acid, caprylhydroxamic acid, caprylyl glycol, and glycerin, which all work together to lock in moisture. Your skin will improve drastically with regular use. Be cognizant of what you put on your skin and what lies next to your skin. A lot of hand soaps are harsh on the skin, containing cleaning agents that strip moisture as well as dirt. Your work colleague’s lotion may contain alcohol as well. And your itchy, scratchy Christmas sweater for Ugly Sweater Day at work may not be the best for your body. Again, choose high quality skin care products for the best results. Add moisture to the air and decrease heat. For those with chronic skin dryness, a whole-house humidifier may be worth the investment. Otherwise, decrease the temperature in your home to prevent the evaporation of essential moisture in the air. As humans, we are all created differently, which includes our skin as well. While the general functions of your skin all apply (such as serving as a protective covering against germs), your skin may react differently to different environments, conditions, pollutants in the air, and skin care products. MDPen encourages you to find what works for you. Try our proprietary skin care products that will reduce the signs of aging, aid in microneedling after care, restore moisture to your skin, and help to prevent dryness. Create a skincare regimen that meets your needs. And if something doesn’t work, try again. The important thing is once you find what works for you, keep doing it! Whether your skin is perpetually dry or it’s dry temporarily from the weather or other activity you’ve engaged in, MDPen can help. Utilize the tips above, and visit our shop online today and order our moisturizers!